Below are some photographs taken by Adrian this week of the finished gallery project which now houses some of my original miniature paintings. 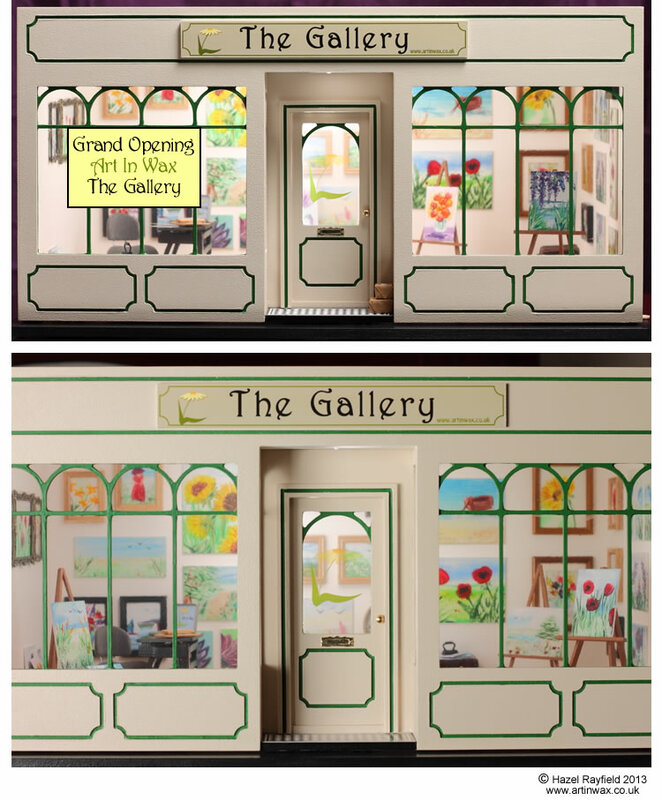 My husband Adrian and I have had a lot of fun building The Gallery, he must take credit for all the work, he has been the project manager, builder, decorator and he has created a beautiful space to display and show my art in wax miniatures. Details of the build, such as how we started with a kit and created this wonderful space, the paint colours, plus how the floor and lights etc were fitted can all be read in our post “The workmen have finished“. Now the paintings are hung the Art Gallery really has come together. The paintings are of various subjects and would suit many different style of miniature property, from grand doll house Manor Houses, to Cafe’s and Modern miniature homes. 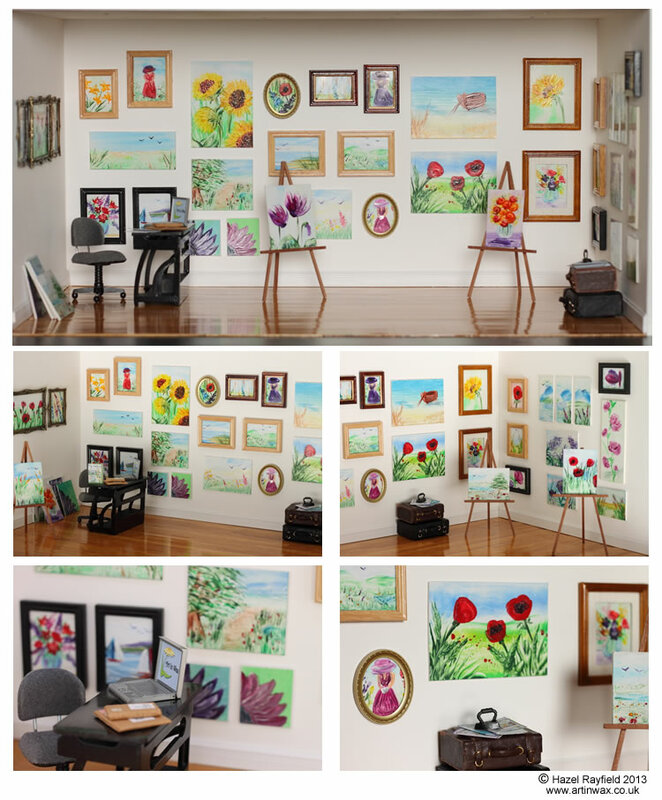 Paintings range from traditional Landscapes, Seascapes, Floral and flower subjects, including some sunflowers, poppies and vases of pretty blooms, plus some Fish paintings and lots more. Some of the paintings have been framed in various style of frame, others have been mounted on to mount board to give the effect of a canvas style picture, I especially like these and they would look great in a modern dolls house. The easels Adrian build are wonderful for displaying the artwork and these together with the little extras we have made, like the brochures and laptop screen saver bring a touch of Art In Wax online into the The Gallery. The suitcases we sourced from a miniature fair, these provide a stand for the art exhibit brochures and the paper weight you might notice is an iron …… as I use heat tools, one of which looks like a mini iron I thought it would be fun to include an iron as a fun and quirky finishing touch. Original Art In Wax miniature art paintings are on sale to buy direct from me the artist in my miniature shop @ Art In Wax and also in my Etsy Store. I am happy to ship internationally as well as to the UK. If you would like to commission a painting, and have something painted just for you, then simply contact me with what type of subject you would like and the size and I will be happy to give you a quote. Do you like “The Gallery” ?